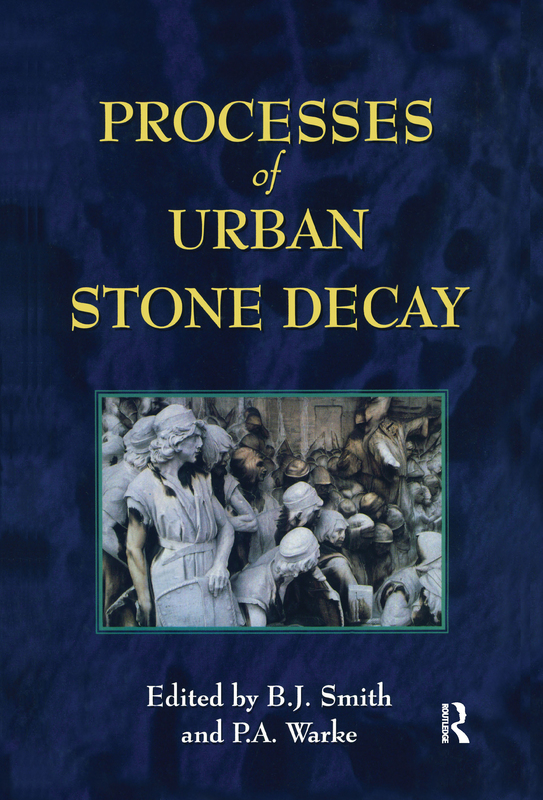 This study examines the various processes and the methods of determining urban stone decay. The contributions include coverage of: spatial variability of dissolution on a limestone surface; ageing of consolidated stone; and techniques for making contemporary copies of stone antiquities. Part 1 Processes: background controls on stone decay in polluted environments - a case study from Rio de Janeiro, Heather Neill and B.J. Smith; spatial variability of dissoluion on a limestone surface, Rob Inkpen; inheritance effects on efficacy of salt weathering mechanisms and durability of sandstone, Patricia Warke; simulation of frost shattering processes in natural and synthetic rocks, Robert Allison and Jeff Warburton; damage caused by the crystallization of salt mixtures, Clifford Price; black crusts formed during two different pollution regimes in the same location, Emer Bell; inherent weakness as a controlling factor in the breakdown of greywackes at two megalithic sites, John Kelly; ageing of consolidated stone, Anuradha Nandiwada; the relationship between air composition and run-off chemistry, Will Luxton; monitoring the impacts of the Oxford transport strategy on stone decay, Heather Viles; regional variations in sandstone decay in the West Midlands, UK, David Halsey. Part 2 Methods: structured approach to analyzing stone decay, Tim Cooper; some methods for assessing stone decay in polluted and "clean" environments, Ireland, Cherith Moses; the application of photogrammetric analysis in the monitoring of surface change during limestone weathering simulations, Annette Shelford; permeation testing of materials, John Beggan; techniques for making contemporary copies of stone antiquities, Malcolm Fry. Part 3 Current and future research: English Heritage and building conservation research, John Fidler; historic Scotland's objectives regarding the supply, decay and cleaning of stone, Ingval Maxwell; current research at BRE on the decay of limestone, Tim Yates.